Janet began painting whilst living in Malaysia, where she was introduced to Chinese brush painting. 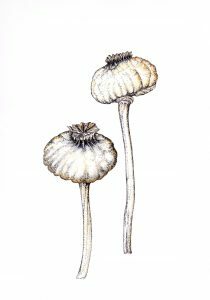 On moving to Bath she began lessons in botanical illustration with Julia Trickey, becoming a member of the BSBA in 2009. She recently gained the distance learning Diploma from the Society of Botanical Artists and is a member of the Oxford Botanic Garden Florilegium. Pen and ink is her favourite medium to work in, but she also works in watercolour.